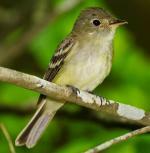 Acadian Flycatcher: Small flycatcher with olive-gray upperparts, pale gray throat, distinctive pale yellow eye-ring, white lower breast, yellow belly, undertail coverts. Wings are olive-gray with two buff wing bars. Long broad-based bill with yellow-orange lower mandible. Black legs, feet. Akohekohe: Medium honeycreeper, mainly black with white or gray crested forehead. Orange eyering extends to orange-red nape. 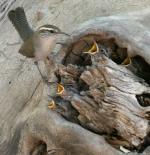 Breast and throat feathers are gray-tipped, orange-tipped feathers scattered over rest of the body. Wings and tail have white edges. Black legs, bill. Direct, strong flight. American Goldfinch: Small, noisy finch. Male has a bright yellow body, black cap, wings, and tail, and white rump and undertail coverts. Wings have flashy white patches and bright yellow shoulder bar. Bill is conical. Undulating flight, alternates several rapid wing beats with wings pulled to sides. American Redstart: Medium, active warbler with black upperparts and hood, distinctive orange-red patches on wings, sides, and long, fanned tail, and white underparts. Bill, legs, and feet are black. It frequently flashes its colorful wings and tail to flush insects from foliage. American Robin: Large, familiar North American thrush, gray-brown upperparts, rich red-brown breast, and white lower belly and undertail coverts. Head appears black with white splotches surrounding the eyes, and throat is white with black streaks. Swift, direct flight on rapidly beating wings. Bananaquit: Small and short-tailed with short, decurved black bill. Black above with white underparts. Belly washed with yellow with bold white stripe over eyes. Rump is yellow. Legs and feet are black. Weak fluttering flight, alternates rapid wing beats with brief periods of wings pulled to sides. Belted Kingfisher: Medium kingfisher, distinct, bushy crest, white collar, and large, black dagger-like bill. 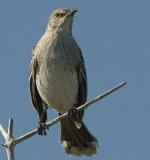 Upperparts are blue-gray and underparts are white. The male has blue-gray breast band. Legs and feet are gray. Slow direct flight with erratic pattern. Hovers above water to search for prey. Bewick's Wren: Small wren with unstreaked, gray to red-brown upperparts and plain white underparts. White eyebrows are conspicuous. Tail is long and white-edged with dark bars. Bill is long and slightly decurved. Legs and feet are gray. Eastern populations have seriously declined since the 1960s.